Kawase Hasui (1883 - 1957) - Born in Tokyo in 1883, this great master of the twentieth-century shin hanga (new prints) school spent most of his adult life as a woodblock printmaker. Unlike earlier ukiyo-e artists whose landscapes typically featured famous sites, Hasui was one of the first artists to record the unknown rural places and urban corners that he found so captivating. He traveled often and recorded the scenic wonders of Japan with drawings and watercolor paintings, which became the basis for many of his prints. In the face of rapid modernization during the twentieth century, Hasui's prints evoke a sense of nostalgia for old Japan and a respect for traditional culture. His romanticized views emphasize the beauty of the natural landscape; figures are absent or often small and insignificant in comparison. His talent for capturing a mood, illustrating a scene, and drawing the viewer into the image makes for some of the most appealing Japanese woodblocks ever created. Hasui was known for his spectacular snow, rain and night scenes. These wonderful atmospheric landscapes are among his best work. A prolific artist, Hasui created about six hundred woodblock print designs during his long career, the majority of them for publisher Watanabe Shozaburo. 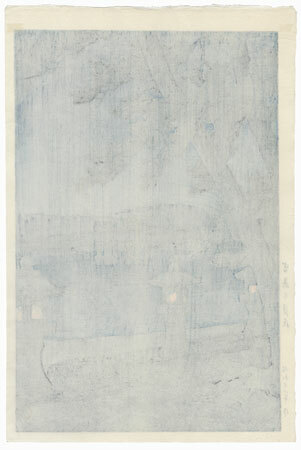 In 1953 the Japanese government bestowed its greatest artistic honor on him by commissioning a print, Snow at Zozoji Temple, and designating it as an Intangible Cultural Treasure. 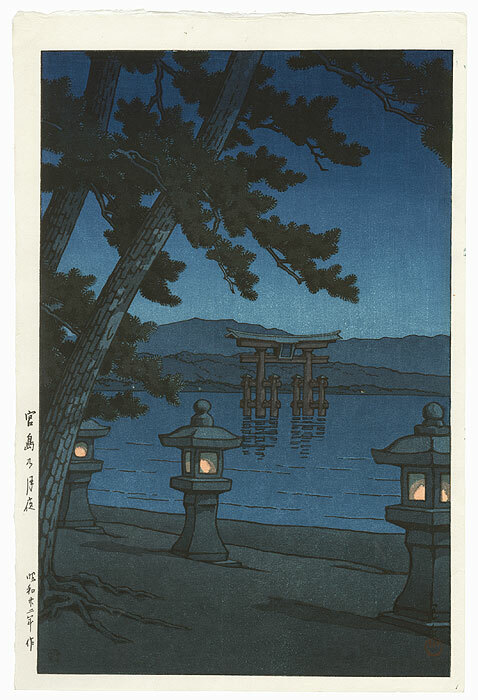 Comments - Beautiful evening view of the famous torii gate at Miyajima at high tide, the base covered with water. 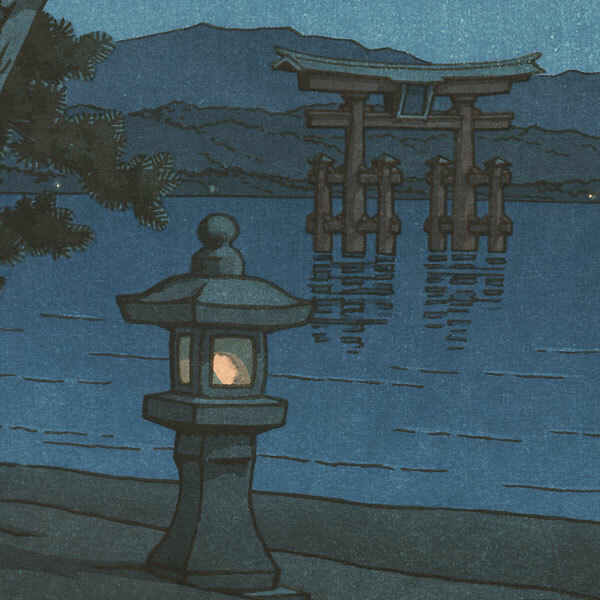 A warm glow comes from the stone lanterns lining the shore, and pine trees frame the view at left. A lovely design with deep rich blues and fine bokashi shading in the night sky. Condition - This print with excellent color and detail as shown. Slight remnants on reverse at top corner from previous linen hinge mounting. Small diagonal crease at corner, a few light creases. Please see photos for details. Good overall.